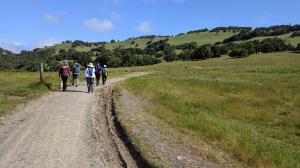 Part of the Sonoma Activity Group starting off along the trails not far from the trailhead. Coppertone and I headed to a new hiking area for us, prompted by an organized hike sponsored by the Sonoma Activity Group. On a previous outing at a Marin County preserve we were almost vexed by a parking shortage that thnkfully was not an issue here. The road along San Andreas Drive is only half taken up by homes, which left plenty of parking along the road on the opposite side for visitors. We overheard a couple of locals comment on the large number of cars and even so parking was not an issue. In total, about 8 group members took off together from the San Andreas Drive trailhead. The route we took circled around the lower stretches of Mount Burdell just to the north. About 600 feet of elevation gain were required and good portion of that was inflicted early on along San Anreas Fire Road at the start of the hike. Despite not hiking to the top of Mount Burdell we were still rewarded with a couple of nice views of Novato and San Pablo Bay to the southeast. Most of the trails were easily to navigate rocky fire roads over rolling terrain through open meadows. A couple of oak groves provided shaded relief from the Sun now and then. With the moderate temperatures and refreshing breezes conditions were fairly pleasant regardless of the tree cover. The preserve is dog friendly, and though we did see plenty of those we might have actually seen more horses than dogs, which seemed surprising.